An iconic red, double decker bus has a message from Matthew 19:26 London, England. City scenes in downtown Lisbon, Portugal. It is a busy city with many shops, cafes and street performers. A young girl with large beautiful eyes arrives to the Greek island of Lesvos. Lessach, Austria. A village that borders the mountain regions of Salzburg and Steiermark. A reluctant mother and her family is photographed in the UN run camp on the island of Lesvos, Greece. On this day the entire Roman Catholic faith focuses on the Easter Sunday Mass on St. Peter’s Square in the Vatican City in Rome, Italy. During Easter and Christmas, the Church hold massive Masses where people from all over the world come to celebrate the Mass and for the chance to see the Pope in person. The Third Baptist Church of Krakow, Poland meets in a church building owned by a Pentecostal church. A group of old men reading the Bible on a bench by the main road in Carcavelos, Portugal. The Rathaus (city hall) Christmas market shares the scene with a busy street of traffic and trams Vienna, the capital of Austria. The rooftops of Krakow with tv antennas . People waiting on their bus visit a souvenir shop in Krakow, Poland. 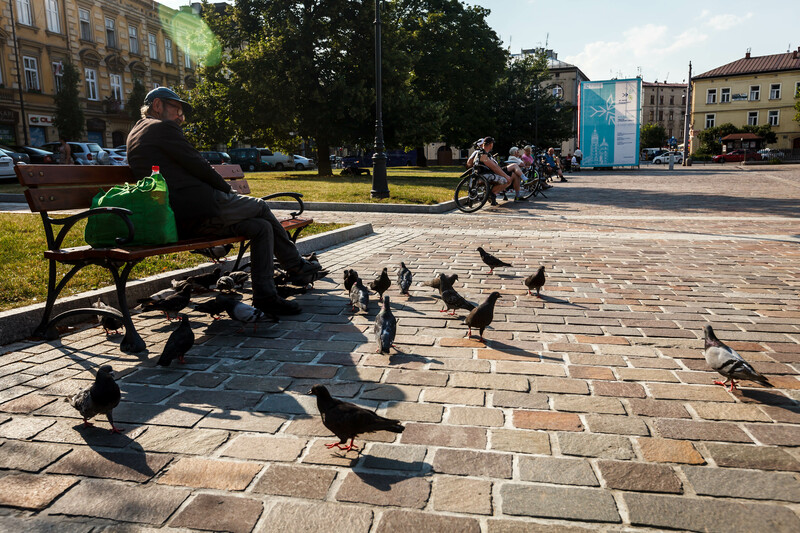 A man feeds birds in a park in Krakow, Poland. Two ladies ride a tram into downtown Krakow, Poland. Krakow’s Wawel Castle overlooks the river Vistula. A brass band entertains a crowd in downtown Krakow, Poland. Selfies on the main square in Krakow, Poland. A woman dressed in a traditional Polish stops for a photo on the main square in Krakow, Poland. A vendor sells traditional Polish goods on the main square in Krakow, Poland. A souvenir shop sells dolls dressed in traditional Polish outfits on the main square in Krakow, Poland. A man dressed in traditional Polish clothes sells feathers and photos on the main square in Krakow, Poland.